As regular readers will know, I love a good Cocktail book. One bearing inspired libations not found repeated elsewhere, gorgeous photography and instruction for even the most inexperienced of home mixologists. It’s no secret I’m drawn in by special details and unexpected elements which might differentiate a guide from its competitors. 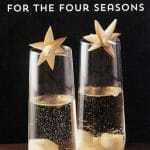 I was thrilled to just preview a perfect little guide ripe for Valentine’s gift giving: Cocktails For The Four Seasons. 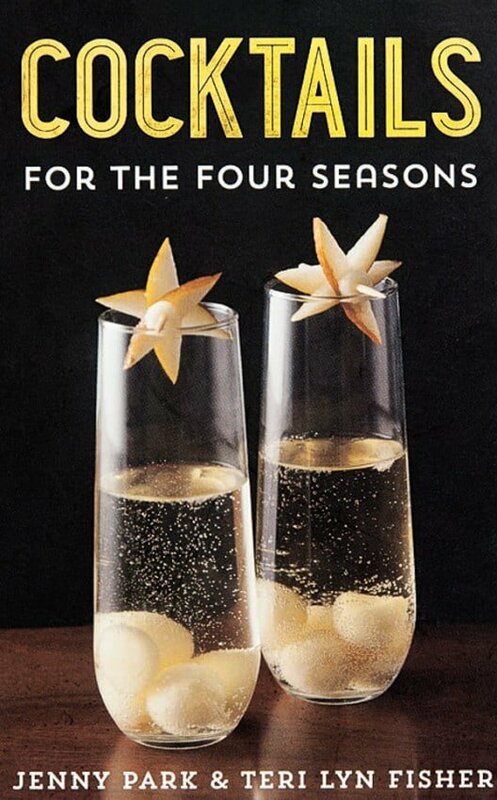 I loved the idea of a cocktail book presented by seasons which is the way I personally approach food. Why not be thinking of cocktails in the same vein? Brilliant. I was enchanted by the varied recipes for each season. 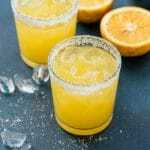 Winter, by example, spans citrus-centric options such as a Sweet Citrus Fizz and Tangerine ‘n’ Cream (a spin on the old school Orange Julius), to more classic type cocktails such as The Gentleman or Clubcar. Each seasonal collection offers a variety of cocktail types sure to please any preferences. Spiked Shirley Temple Cocktail | photo credit: Peter Pauper Press Inc.
Cocktails For The Four Seasons begins with a bar(wo)man’s guide to barware (glass types and tools), both a descriptive photo and details of each item. Instructions for fun garnishes and a base Simple Syrup recipe are also included. 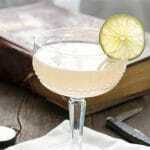 A glossary of all liquor and liqueur types ensures full understanding of the book’s ingredients. Something I particularly appreciated is the double index; the first cocktail-by-liquor type, and a traditional index by name. These are the functional attributes that make this guide well-rounded and unique, but it’s much more than that. The photography is exquisite. The book’s authors, Jenny Park and Teri Lyn Fisher, truly apply their dazzling skills to make this book a treasure. Creators of the award winning blog, Spoon Fork Bacon, Park is a Le Cordon Bleu grad, as well as food stylist and recipe developer, and Fisher a skilled photographer and an enthusiastic home cook. Their impressive client list includes HGTV, Food & Wine and Bon Appetit. It’s no wonder why. Their recipes are contemporary and mouth-watering, each bearing a twist of originality sure to impress your guests in appearance and flavor profile. The photographs, as mentioned, simply alluring. It’s a book you’ll read, not just use to mix cocktails from. 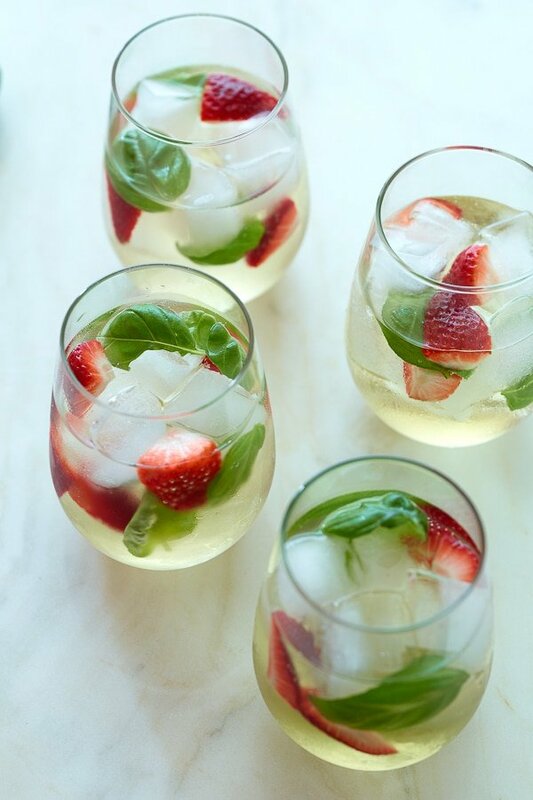 Strawberry Basil and White Wine Sangria | photo credit: Peter Pauper Press Inc.
Perhaps the most unexpected and charming element of Cocktails for The Four Season is its size. When it arrived in the mail I was immediately smitten with the barely-larger-than-a-deck-of-playing cards 6-inch by 4-inch stature. The bound spine covers a spiral binding allowing the book to lay flat when in use. A built-in elastic bookmark marks a favorite page when whipping up a cocktail. The book is simply beguiling. Love is in the air, both for this charming book and Valentine’s Day. 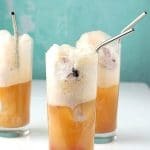 It’s seemed apropos to share a few Valentines-perfect recipes to whet your whistle and give you a sample of Cocktails For The Seasons. It’s really too fun to miss! In addition Peter Pauper Press Inc., Cocktails for The Four Seasons’ publisher is giving away a copy to a BL reader! It may also be purchased on Amazon.com. 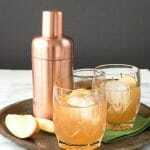 The Honey Bear cocktail | photo credit: Peter Pauper Press Inc.
Place the vodka and Luxardo into a cocktail shaker and fill it with ice. Shake for 1 minute and divide the mixture into four coupe glasses. 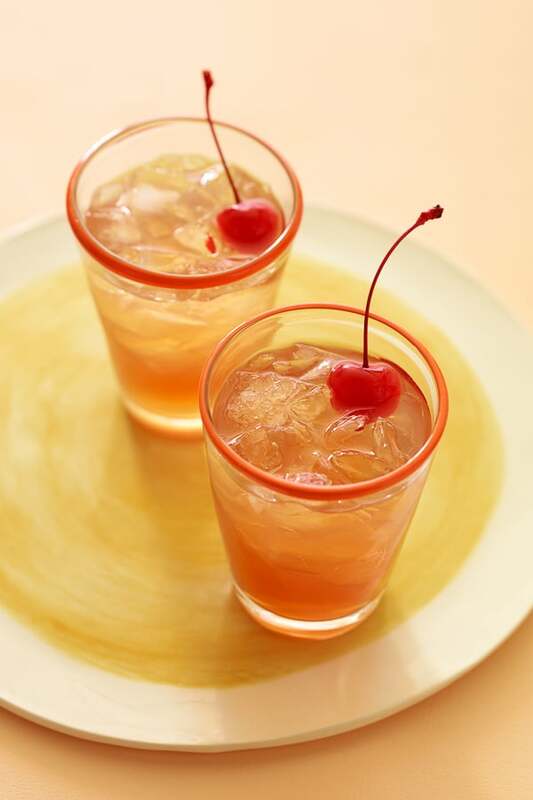 Top each drink with the lemon-lime soda and finish with a drizzle of maraschino cherry juice. 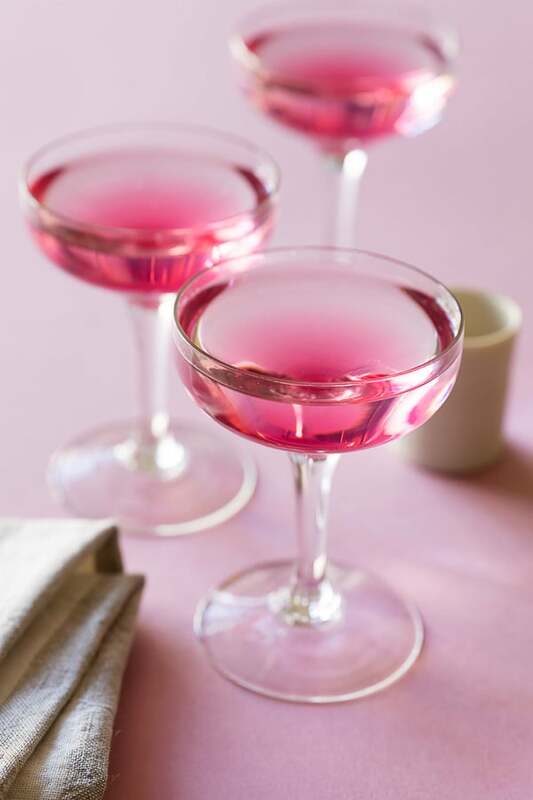 Garnish each glass with a maraschino cherry, if using, and serve. In a small bowl, stir together the bourbon and warmed honey until the honey dissolves. Pour the honey-bourbon, Tuaca, Meyer lemon juice, and maraschino cherry juice into a cocktail shaker and fill it with ice. Shake for 1 minute and divide into four half-pint glasses filled with ice. Top each drink with two dashes of orange bitters and garnish with a maraschino cherry. Serve. *Maraschino cherry juice can be found in specialty stores, supermarkets, and online. Recipes excerpted from Cocktails For The Four Seasons with written permission from Peter Pauper Press, Inc.
Disclosure: I was provided a review copy of Cocktails For The Four Seasons. All opinions are my own. These will change up our cocktail hour!! My current favorite drink is the Salted Caramel Apple Martini! Omg the goodness inside that drink lol. My favorite “cocktail” is 50/50 pineapple juice/cranberry juice. Cheers! I don’t have a favorite cocktail. I love a good cocktail. And a cocktail (or two) for each season, is a spectacular idea. My favorite cocktail is a ginger martini. i love any cocktail that includes st. germain! that Shirley temple looks good. cheers! My favorite cocktail is a Cape Cod (Vodka and cranberry). Delicious. my favorite is a fuzzy navel. Cheers! I love a cosmo! cheers! I have been doing an orange Julius cocktail lately with citrus and whipped vodka that is excellent..I would love to won this book because I like unusual art drinks..These look cool. My favorite cocktail is a Wisconsin Old-fashioned. I love a well made spicy Bloody Mary!